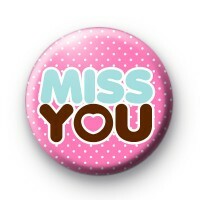 Miss You Button Badge in pink with white polka dots and the words Miss You written in blue and brown text. Also features a lovely pink love heart design. These romantic badges are popular with long distance relationships & a good way to show you miss someone if you are spending time apart. Wear one of these badges while video calling your loved ones. We have a great range of love badges, romantic badges and valentines day badges available on the website. Most can be found in our valentines day category, but you can browse the website or use the search box to find badges for all occasions. 25mm button badge made in the UK.